Who's up for some Gunbird 2? Mike? I'm game; I'll try and play this and some MM this weekend. I might get in on this soon. I really haven't played enough Gunbird in my life. you should so fix this, bud. The Gunbird games are awesome. Somewhere between bullet-hell and old school shooters lies Psykyo's bird of gun. some things I picked up from just playing (I haven't actually looked up FAQ's or anything on it yet). 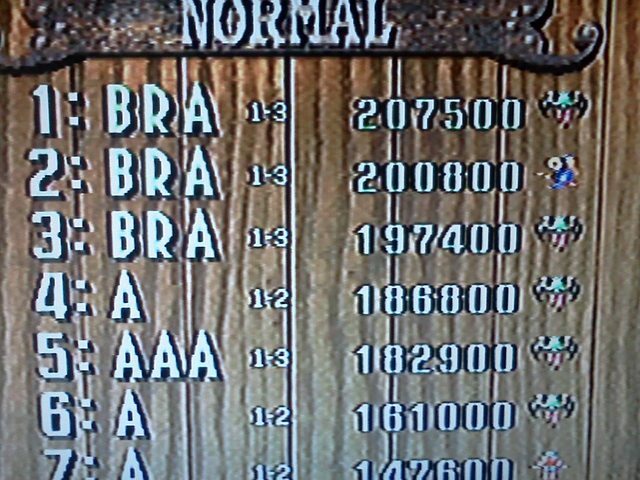 *I've played Gunbird 2 a lot in the past, but that was before I cared about playing for score. DC has two hidden characters FYI... highlight the "?" when choosing a character and hit UP for Morrigan or DOWN for some other guy. I've tried every character. Alucard is awesome for power/speed combo. Marion is probably easiest as her power-ups end up homing (just like in the first Gunbird). 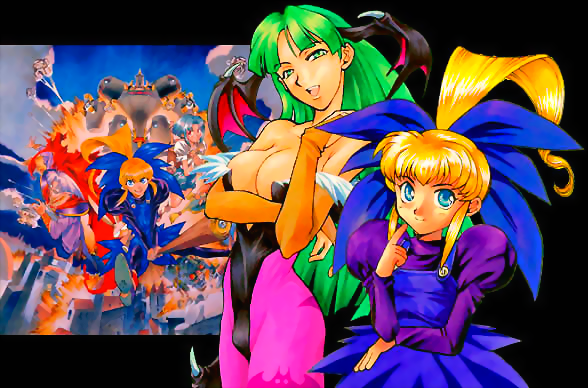 Morrigan is awesome cuz she's Morrigan. *I don't know what the defaults are as I change my button setup to one comfortable for me. Shot... I actually didn't think to check if it does anything if you hold it down. Bomb... this is Psikyo so there's no penalty for bombing (that I know about). Close... is awesome. It's kind of like the Dragon that comes out in uh was it Steel Dragon? It's a close attack that is super powerful. So if you can get in close to a boss or tough enemy it F's them up but of course you have a better chance of getting blasted in the process. This seems somehow limited. There must be a gauge or indicator to know if it's re-filled or if you have another Close Attack left. I should really read the manual. RANK - again, this is Psikyo. 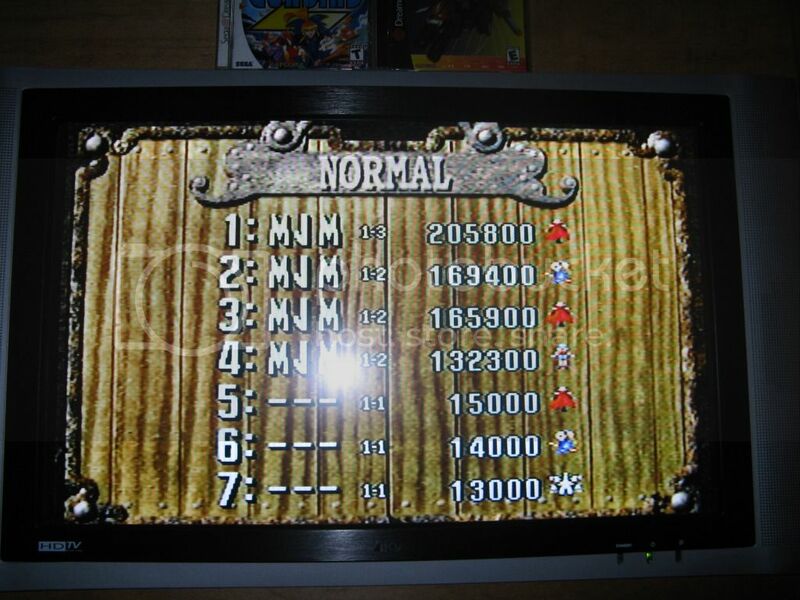 SO yeah the more power-ups (which seem to also be speed-ups) you collect the harder rank gets. ENEMIES - will not hurt you if you run into them, but they will cause you to lose 1 power-up. (I don't know if they kill you if you're all the way powered-down). BOSSES - can be milked. Not sure about tech bonus. Not sure about time bonus/penalty. TRAINS - are in this game. I'm in for sure - this one doesn't make my head hurt or cause me to do constant restarts. DC Defaults are level 5, 3 lives, and 600K extend, so we're all on the same page. Screen orientation (Original 1, Original 2, Vertical all score the same) so it is just preference. way to just barely beat me Mike. Oh something else. Sometimes this weird guy pops up and throws done huge green gems that are worth points. No idea how to make him appear though. yeah, the green gems are triggered by consecutive close shot kills on large enemies (I think). I'm at 268K now. It's amazing how a run is either really good or really bad right out the gate haha.